Imagine a bendable tablet computer or an electronic newspaper that could fold to fit in a pocket. The technology for these devices may not be so far off. Northwestern University researchers have recently developed a graphene-based ink that is highly conductive and tolerant to bending, and they have used it to inkjet-print graphene patterns that could be used for extremely detailed, conductive electrodes. The resulting patterns are 250 times more conductive than previous attempts to print graphene-based electronic patterns and could be a step toward low-cost, foldable electronics. A paper describing the research, “Inkjet Printing of High Conductivity, Flexible Graphene Patterns,” was published April 8 in the Journal of Physical Chemistry Letters. Inkjet printing has previously been explored as a method for fabricating transistors, solar cells, and other electronic components. It is inexpensive, capable of printing large areas, and can create patterns on a variety of substrates, making it an attractive option for next-generation electronics. Inkjet printing with graphene — ultra-thin sheets of carbon with exceptional strength and conductivity — is extremely promising, but it has remained a challenge because it is difficult to harvest a sufficient amount of graphene without compromising its electronic properties. Exfoliating, or breaking apart, materials such as graphite often require oxidizing conditions that make the resulting graphene oxide material less conductive than pure carbon. Pristine unoxidized graphene can be achieved through exfoliation, but the process requires solvents whose residues also decrease conductivity. 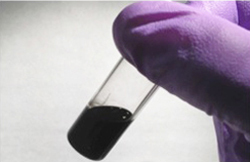 The Northwestern researchers have developed a new method for mass-producing graphene that maintains its conductivity and can be carried out at room temperature using ethanol and ethyl cellulose to exfoliate graphite. This relatively clean process minimizes residues and results in a powder with a high concentration of nanometer-sized graphene flakes, which is then mixed into a solvent to create the ink. The researchers demonstrated printing the ink in multiple layers, each 14 nanometers thick, to create precise patterns. The ink’s conductivity remains virtually unchanged, even when bent to a great degree, suggesting that graphene inks could be used to create foldable electronic devices in the future. In addition to Hersam, other authors of the paper are McCormick graduate students Ethan B. Secor and Michael L. Geier and postdoctoral researchers Pradyumna L. Prabhumirashi and Kanan Puntambekar. This work was supported by the Office of Naval Research.